This Screenshot Summarizes the Game in a Nutshell: Missing the Mark. Welcome to this episode of the Space Game Junkie Podcast my friends! 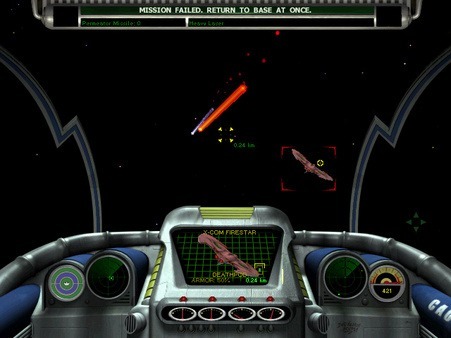 In this episode, Jim and I sit down and try to dissect 1998’s X-COM Interceptor from Microprose. It’s a very confusing situation, as this sim doesn’t get one particular part of its gameplay spot on right, and as best we could find, none of the folks who worked on it had either previous space sim OR X-COM experience, so we’re left wondering (Edit: Okay, this is wrong, I’ve come to find out the lead designer — David Ellis according to Mobygames — wrote the strategy guides for the three previous X-COM games, so there IS a connection)…how did this game get made? WHY did this game get made? Sadly we never really figure it out, nor do we find the fun, as the game has just such a head-scratchingly bad interface it’s almost as if the developers were striving to make it frustrating. If that was their goal, they succeeded, because as much as I want to love this game for its strategic elements like its dynamic campaign, it’s horrid UI and ridiculous flight model just basically ruin the whole experience, sadly. We actually end up talking about other stuff for much of the podcast because gah, this game. Next week, we’ll go back even further in time to talk about 1995’s fabulous 4X, Ascendancy, with our friend Nate from eXplorminate. Thanks for listening/watching folks, and enjoy the show!